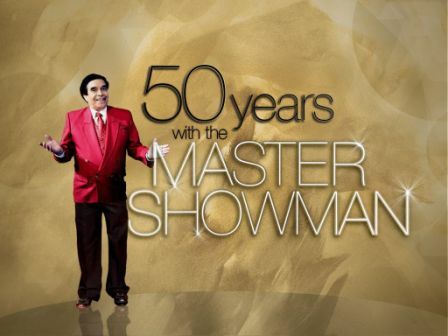 'Master Showman' German Moreno Celebrates 50 Years in Showbiz with the Biggest Stars! This Wednesday (April 24), the biggest names in the entertainment industry will once again unite as they all pay tribute to the one and only German Moreno or Kuya Germs, as he is fondly addressed by many, for his continuing efforts to discover, build, and nurture stars in the Philippine world of showbiz. Happening at the plush Newport Performing Arts Theater, Resorts World Manila, well-known personalities from radio, television, and the movies will gather to share their love and recognize the man who brought out their star potentials and helped shape their destinies. Gloria Romero, Susan Roces, Nora Aunor, Sharon Cuneta, Janno Gibbs, Manilyn Reynes, Dawn Zulueta, Raymond Lauchengco, Jackielou Blanco, Rachel Alejandro, Pilita Corrales, Carmen Soriano, Elizabeth Ramsey, Jean Garcia, John Nite, Glaiza De Castro, Tina Paner, Sheryl Cruz, Keempee De Leon, Dulce, Jessa Zaragosa, Gary Valenciano, Martin Nievera, Pops Fernandez, Jaya, Vina Morales, and David Pomeranz are only some of the names who will surely surprise viewers not only with their performances but also with their memorable moments with Kuya Germs.